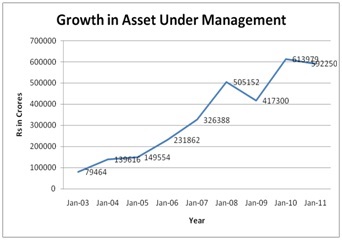 Mutual Fund Industry Analysis | Business Article | MBA Skool-Study.Learn.Share. Figure.1, Source: AMDFI data, Note: As of 31March of each yr Figure.2 Source: Reports on trends and progress of Banking in India, various issues. Even though the figure of 20% seems impressive there is still a lot of growth potential for this industry. 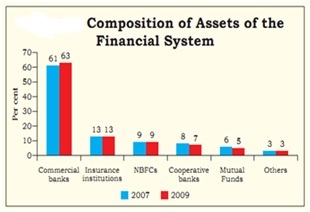 In India (year 2009) the commercial banks still account for more than 60% of the total assets of the financial system (Figure 2) which is much larger when compared to 5% share of mutual fund. Mutual funds are generally classified by their principal investments. In order to judge the performance of these funds we compared each of the funds with the equivalent investment types. Equity funds and ELSS vs. BSE Sensex can be compared with stock indices in order to see whether they give a better return than randomly investing in any stock. In the last 3 years since October 2008 till October 2011 BSE sensex has increased at a rate of 18.8% compounded annually (Figure.3). In order to analyse the performance of equity funds histogram diagram of last 3 years return (October 2008- October 2011) (compounded annually) of 220 equity funds (excluding tax saving and sector funds) is shown in Figure.4. Based on the figures mentioned in table.1 one can infer that an average mutual fund’s return (Average return 22.15%, Median return 19.77%) is better than the return given by BSE sensex in corresponding period. The major cause of concern though is the high variance of 37.88% which reflects the riskiness of return if an investor chooses any one of the 220 mutual fund for investment. Money invested in ELSS gets tax deduction. The median value of 20.33 is higher and variance of 29.49% is lower (lower variance implies lower risk) than equity fund. If an investor is looking for high risk- high return investment opportunity then for them equity fund would be a better option than just randomly investing in stock market. For someone who can take advantage of Section 80C of the Income Tax Act, ELSS is an even better option. Bank deposits have low liquidity compared to debt schemes. The overall performances of debt schemes in the last three years have been below par compared to deposit rates. The average deposit rate (above one year maturity) in the last 3 years is 8.44% (Table.3) which is more than both average (7.46%) and median return (6.86%) given by debt funds (Table.4). Hence if an investor is looking for low risk- low return investment opportunity then for them debt schemes won’t be an appealing option. Customer perception and awareness: According to Google Insight ‘Mutual Fund’ is most searched phrase by Indians since 2006 till date when compared to the phrases like ‘Investment’ and ‘Stock Market’ (Figure 7). This data implies how much people are interested for mutual fund. 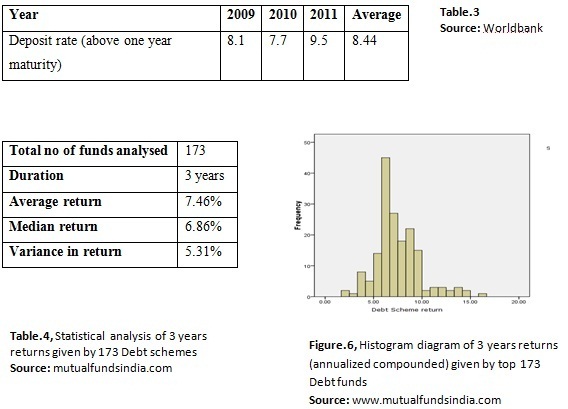 On comparing figure 1 with figure 7 we can observe that between 2007-08 people were very interested (peak in Google search volume) in mutual fund and at the same time the growth rate of asset under management (AUM) of mutual fund was also at its peak. For the last one year the search volume is on a decline so is the AUM (declined by 3.5% in the last 1 year). Overall the trend shows that interest for mutual fund moves in tandem with the stock market. Ease of investment: While mutual fund in India is metro centric it is also gaining footholds in tier I and tier II cities. As of march 2009 the mutual fund industry had around 90 thousand registered distributors (Source: AMFI). 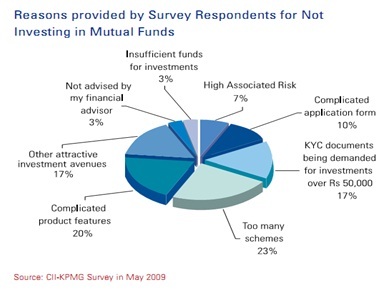 According to the survey done by CII-KPMG in 2009 the two key impediments that affects the decision of an investor from investing in mutual funds are (Figure.8). The latest figure released by SEBI says that there are about 1151 mutual funds currently registered with them, which is good enough to confuse an average investor. Overall the mutual fund industry has grown by leaps and bounds in the last few years and given the very low penetration it still holds a lot of growth potential in near future. We already have all kinds of mutual funds for almost all different investment principles but the real challenge for any asset management will be to match an investor with the fund he should invest into. This article has been authored by Krishnakant Sahu and Gaurav Kawale from SJSOM, Mumbai.